Sri Ganesha, also known as Lord Ganapati and Lord Vinayaka, is one of the best-known and most adored deities in the Hindu pantheon. He is the God of knowledge and the remover of obstacles and He is also the older son of Lord Shiva – The Auspicious One. The earliest known images of Lord Ganesha date back to as far as the 2nd century, during the Gupta Empire that is also known as the Golden Age of India. Lord Ganapati is worshipped and prayed, or at least remembered, in the starting of any auspicious performance for blessings and auspiciousness. Vinayaka is a usual name for Lord Ganesha that appears in the epic Puraāṇas and in Buddhist Tantras. This name is mirrored in the naming of the 8 famous Ganesha temples in Maharashtra known as the Ashtavinayak. In Sri Lankan Singhala Buddhist areas, Lord Vinayaka is known as ”Gana deviyo”, and worshiped along with Lord Vishnu, Gautama Buddha, Lord Skanda and others. He is said to have two mothers. Nevertheless, the mothers are not Goddess Lakshmi and Goddess Saraswati as one other answer mentions. They are Ganga (said to originate in the matted locks of Lord Shiva) and Goddess Parvati (the consort of Lord Shiva). There are various anecdotes which explain how Lord Ganapati broke off one of his tusks. Followers occasionally say that his single tusk indicates his capacity to overcome all forms of dualism. In India, an elephant with one tusk is occasionally called a “Ganesh”. The cult of Lord Ganapati is widely diffused, even outside of India. His followers are called ”Ganapatya”. The Ganapati festival is celebrated with devotion and great enthusiasm throughout India but in the city of Mumbai, the financial capital of the country, the festival assumes an exceptional significance because of the scale at which it is performed. The principal scriptures dedicated to Lord Ganapati are the Mudgala Purana, the Ganesha Purana, and the Ganapati Atharvashirsa. Brahmanda Purana and Brahma Purana are other two Puranic genre encyclopedic sacred texts that deal with Lord Ganesha. He is usually portrayed colored red, having one tusk broken, He is pot bellied, and has 4 arms that may hold a goad, a pasam, and a pot of rice, or sweetmeats. His 4th hand’s palm is always extended to bless people. His vehicle is a tiny mouse. Furthermore, Lord Ganesh is commonly depicted playing a musical instrument. 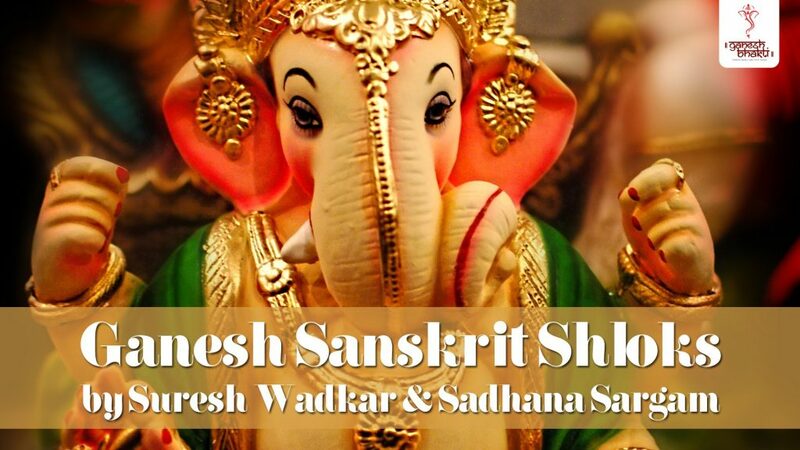 Much like Lord Krishna, Sri Ganesh affirms life by celebrating its beauty and pleasures. Chanting this powerful mantra with a correct pronunciation and sincere devotion will ward off all trials and troubles, gracing the practitioner with every success. The minimum repetitions of the Ganesha mantra should be one full 108 times, preferably in the morning, before sunrise. This entry was posted in Hindu Mantras on September 13, 2016 by admin. What Are The Lyrics And Meaning Of Mittar Pyare Nu Shabad? What is The Meaning of Sita Ram Mantra Sri Ram Jai Ram? What is the Meaning of Pavan Guru Mantra (Pran Bandha Mantra)?